Southern front: Withdrawal movement according to plan. Enemy pressure negligible. Saboteur activity with heavy weapons in the area Montélimar – Loriol. Luftflotte 3 Daily Situation Report. The II. Jagdkorps was informed that the “detachment of Jafü Süd which was ordered” had operated for the first time on 23 August. This almost certainly referred to JGr. 200 aircraft which had reached Dijon, although no further details were given. Nevertheless, Nineteenth Army, after urgent requests to Luftflotte 2 in Italy for photo-reconnaissance of roads in Provence, complained that evening that there had been no coverage of its eastern flank. Nevertheless, Ob. Südwest noted that “our own Luftwaffe carried out battle reconnaissance in the Ligurian region”. The mid-afternoon strength return from 5. (F)/123 noted that Ltn. Weber (the unit's Technical Officer) was detached along with Bf 109 G-6 W.Nr. 412169, a detail whose relevance to this story will shortly become clearer. 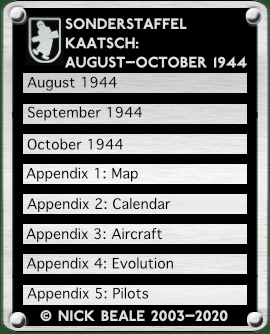 Early in the day a signal went out to Jafü Süd at Dijon to say that the flying and ground elements of JG 200 assembling there were to be attached to Aufklärungsstaffel Kaatsch, operationally subordinated to FAG 123: their task would be reconnaissance to support Nineteenth Army’s withdrawal. Also, Dijon’s base command signalled a Major Holzmann (serving with an unidentified liaison platoon) that “Aufklärungsstaffel K reinforced with forces from Jagdgruppe 200” would probably be ready to operate from there next day. This was the first Allied Intelligence had heard of the new Staffel. At 17.40 hrs. one Bf 109 from 4. (F)/123 and two from the 5. Staffel took off for Dijon; an hour later, 5. (F)/123 reported that Obltn. Spies (Staffelführer), Ltn. Weber (Technical Officer), Uffz. Kuhlmann and Uffz. Müller had been detached to the same place. The three Bf 109s leaving on the 24th had, along with Weber, been listed as “detached” the day before. The same was true of W.Nr. 412169 so the clear inference is that this machine too was in Dijon. At 20.00 hrs. OB West, a little behind events, signalled Nineteenth Army that 5. (F)/123 was transferring to Dijon to co-operate with it and that its first task would be to cover the area east of the River Rhone plus Digne, Grenoble and Lyons, keeping in touch by radio. … End of July–August. That was the hardest time. There were three pilots in the Staffel all told. We got no supplies, a certain number of people killed. It was always the same people doing the flying. So from 20–31 August I flew 23 missions. NOTE: Warthol’s Bf 109 “black 17” was shot down on 16 August, so he probably meant 20–31 July. A week later, a signal described his aircraft as a G-5, adding that Uffz. Wilhelm Bothe had been reported killed on a mission over the Invasion Front on the 21st when his Bf 109 G-6 marked “34” crashed near Amiens. At 23.00 hrs. came yet another urgent request from Nineteenth Army which was planning a “breakthrough attack” the following morning. For this it sought a bomber and ground attack operation against Marsanne (14 km north east of Montélimar) as well as attacks on villages, troop movements and concentrations east of the line Crest - Puy - St. Martin. Finally it wanted reconnaissance cover of the supply roads Serres – Nyons, Serres – Crest and Digne – Grenoble. During the morning, Ltn. Weber reported that a three-strong detachment of 5. (F)/123’s Bf 109s had arrived in Dijon and was serviceable. This was somewhat contradicted by his colleague, Oblt. Theodor Spies, who reported to FAG 123 at 10.00 hrs. that Sonderstaffel Kaatsch had arrived with a “full complement” of five aircraft and would be serviceable in two hours. However, bomb racks and 300-litre drop tanks were urgently needed and Major Kaatsch himself had yet to report in. More detailed requirements were notified that evening: 300-litre tanks with attachment bands; 10 brake foot pumps; 3 cm ammunition for the MK 108; and 10 sets of 660 x 160 mm tyres. NOTE: In these first few days Staffel Kaatsch seems to have been used to denote the five reconnaissance Bf 109s, to which JGr. 200’s remnants were attached. After that, references to the Staffel seem to have embraced both the fighter and reconnaissance contingents. The request for MK 108 ammunition is one indication of that, this cannon was installed in the Bf 109 G-6/U4 — as flown by JGr. 200 — but not in the FAG 123 machines detached to Dijon. The 4. and 5. (F)/123 had been trained and equipped for photo reconnaissance; JGr. 200 was composed of fighter pilots and its aircraft lacked cameras. There had been a tactical reconnaissance unit, 2./NAG 13, alongside JGr. 200 in Southern France but this Staffel — reportedly down to one serviceable aircraft — had already been ordered out of France and was on its way to rest and refit at Landsberg-Lech in Bavaria. Meanwhile, 5. (F)/123's remaining pilots and aircraft were supporting the 4. Staffel further north. Despite the material deficiencies mentioned above, from 13.33–15.55 hrs., aircraft of “strong indications Jafue South” reconnoitred roads around Clermont and Issoire, the airfield at Valence, Dijon and Lyon. These machines may in fact have come from 5. (F)/123 which had been ordered to reconnoitre roads around Voiron (north west of Grenoble) and in the St. Rambert – Valence – Bourg – Beaurepaire area. During the day, Luftflotte 3 was advised that the new Staffel did not have the range to meet Army Group G’s request for reconnaissance LXIV. Korps’ movements in the Poitiers area (a round trip of about 750 km). That afternoon four P-47s strafed Dijon destroying a crash-landed He 177; a Ju 88 was shot up; and an Army ambulance driver was seriously wounded. At the same airfield, I./NJG 2 reported the destruction of a Ju 52 and a Ju 88 plus another Ju 88 as 10% damaged. The 5. (F)/123’s evening strength return listed four aircraft under heading “63”: Werk Nummern 161361, 163361, 163174 and 15862. Allied Intelligence knew only that category 63 denoted some form of unavailability but since three of these machines appear in later messages from Dijon, they were clearly on detached duty with Kaatsch. One aircraft however had come home after just two days, W.Nr. 412169 was no longer detached but unserviceable in “category 12” (a problem apparently fixed over the next 24 hours).